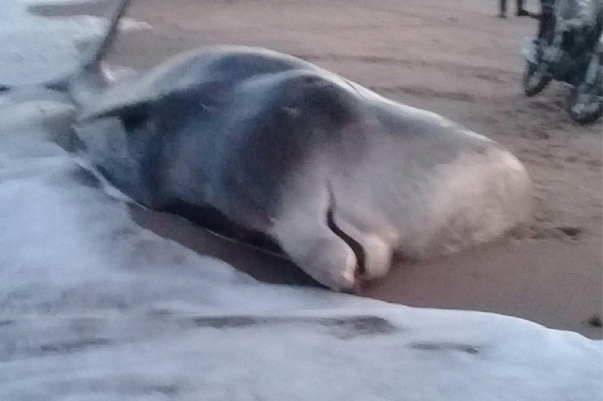 Residents of the village of Lopshenga, Primorsky District of the Arkhangelsk Region, discovered a high-mouty bottlenose ejected by the storm on the White Sea coast. This was reported on Monday by the press service of the Kenozersky National Park. The length of the bottlenose was 9.2 meters, the span of the caudal fin was 2.3 meters, the girth in the region of the pectoral fin was 5 meters. According to the deputy director of the Russian Arctic National Park for scientific work, Ivan Mizin, it is a rarity to see a tall-browed bottlenose in the White Sea. “It is safe to say that the animal has penetrated the Barents Sea. In general, the migration and habitat of bottlenose in the waters of the Russian Arctic have been little studied. Therefore, any information about his meetings and the opportunity to see even a dead animal is very important, ”the National Park press service quotes Mizin. He noted that the last time such evidence was registered in the White Sea in the last century. The reasons for the release of a mammal on the shore are not yet clear. The high-bottle-nosed bottlenose dwells in the north of the Atlantic Ocean to the level of polar ice, is known for its ability to dive to great depths, it feeds mainly on squid. This species of whale is listed in the Red Book.